Forget Virginia! The Inland Northwest is for lovers — with dates in Riverfront Park, weddings at the Davenport and music supplied by The Rub. The Inlander's Best Of guide can grant many wishes, but it can't yet force the man or woman of your dreams to fall in love with you. All it can do is show you where to go. 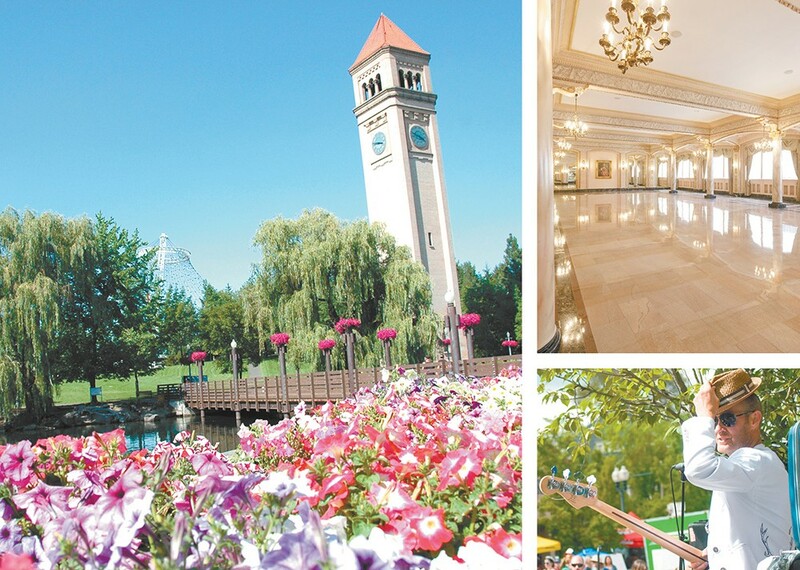 Begin at RIVERFRONT PARK, the best place in Spokane for a cheap first date. You start out roller skating on the skate ribbon, and you try to pull off some fancy pirouette to impress her. She laughs when you fall flat on your rear. Normally, you'd be embarrassed. But you love the way she laughs so much you don't even care. You feed the garbage-eating goat statue together, her hand in yours. You take a spin on the Looff Carrousel, her on the tiger, you on the giraffe. You lean out and snag a golden ring as the carrousel spins, good for one free ride. But instead, she tugs at the sleeve of your sweatshirt, pulling you toward the SPOKANE FALLS. You kiss her, right then and there. She kisses back — one of those deep, one-leg-lifted, whole-world-around-you-melts-away kisses. The roar of the falls drowns out the jeers and whistles of the onlookers. A year passes. It's a year of impossible happiness, of long nights with her spent in dazzling conversation, sometimes without saying a single damn word. To celebrate, you take her to one place in Spokane that can compete with Riverfront: MANITO PARK. There, with the cherry blossoms blooming in the Japanese gardens, you get down on one knee. Her eyes go wide. And that's when you reach into your pocket and pull the golden ring, the one from the carrousel on your first date. She says yes. The kiss that follows is almost as good as the one by the falls. You hire THE RUB to play the wedding. Year after year, you'd both seen the Rub play Elkfest, but somehow you never met. You even stumbled across an old Facebook photo from 2016: The Tambourine Man twists frantically as the Rub plays with a wild, gleeful abandon — and you're both there in the same photo dancing along in the background. You hold the reception at the DAVENPORT HOTEL, the one place that's classy enough and Spokane enough for a classy Spokane couple like you. So there's love. There's marriage. What's next? Baby in a baby carriage. But the thought is a little scary. You've never been pregnant, and neither has she. She hasn't even found an OB-GYN she's happy with yet. But finally, you two find JAMES BRASCH, a doctor with Associates for Women's Health. You tell some people that it was because of the rave reviews online. You tell others that you heard about him through Brasch's bookkeeper, who calls him the epitome of kindness, decency and intelligence. But, in truth, you chose him because he was named the Best Baby Doctor in the Inlander's 2019 Best Of issue, the guide that somehow has perfectly predicted every turn of your relationship. The news comes a few months later: "I'm pregnant," your wife says, beaming. As soon as you get back home, you duck into the garage, pull away the loose brick in the back, where you have a dog-eared copy of the Inlander's 2019 Best Of stored away. It always knows what to do. But this time, it doesn't have any guidance to left to offer. You've finally read to the end. This is where we part ways, the Best Of guide tells you. "Don't leave me," you plead with the guide. "I don't know how to live the Best Of life without you." Shh, the Best Of guide says, catching your tears with its pages. It's time. I've given you everything you need to know — the best date spots, the best restaurants, the best local Instagrams. Don't you see? You're going to be a dad. You're going to become a Best Of guide. It's your job to pass along what you have learned about the Best Of the Inland Northwest to your child. And someday, she will pass on that same sacred knowledge to hers. She? You smile as you close the guide one last time. Apparently, you're going to have a girl. You're going to be good parents, you think. Maybe even the Best. The original print version of this article was headlined "Best of Romance"